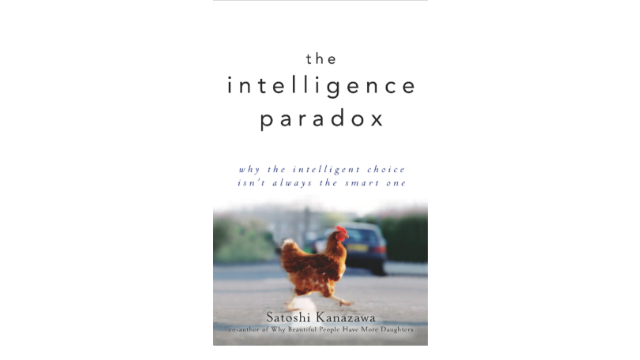 My book, The Intelligence Paradox: Why the Intelligent Choice Isn’t Always the Smart One, is also about what people want – their preferences and values. What do people want? Why do people want what they want? Where do individual preferences and values come from? These are some of the questions that I address in the book. These questions are known as the “problem of values,” and it is one of the central questions in social and behavioral sciences. Mathematically elegant models of human behavior, especially in microeconomics, can explain human behavior very well, if we know what people want in the first place. These microeconomic models essentially say “Human actors do the best they can within their constraints and circumstances to achieve what they want to achieve,” and their mathematical models are about how these constraints and circumstances affect their choices. However, these models cannot tell us what human actors actually do and what actual choices they make, unless we know “what they want to achieve,” namely, their goals, preferences, and values. Without the knowledge of individual preferences and values, any choice can be used to support the microeconomic models. Let’s say two individuals, A and B, are facing identical constraints and circumstances; they both find themselves at a local grocery store, with limited choices of items to buy and only $10 to spend. If, under these conditions, Individual A purchases apples and Individual B purchases oranges, both choices can be used to support the rational actor model, by positing, ex ante, that Individual A has a preference for apples while Individual B has a preference for oranges. If, under the same conditions, Individual C chooses not to buy anything at all, that, too, supports the theory because Individual C has a preference for savings. In order to provide a full explanation of human behavior, we must endogenize individual preferences and values, by making them part of the theoretical explanations. We must first explain individual preferences and values before we can explain the behavioral choices. We must be able to explain why Individual A wants apples, not oranges, and why Individual B wants oranges, not apples, and why Individual C wants neither. Economists since then have faithfully followed Stigler and Becker’s dictum and left preferences and values unexplained. They focus on money – how individuals seek to maximize income and wealth – because money is fungible; people can use money to buy virtually anything they want (except, of course, for love). Economists reason that they don’t need to know people’s preferences and values because they would all want to maximize monetary incomes regardless of their idiosyncratic preferences and values. Whatever they want, they all want more money because more money will allow them to have more of whatever they want. With more money, you can buy more apples, more oranges, or increase the level of your savings. So, in the above example, Individuals A, B, and C – in fact, all individuals – would want to maximize their monetary income because it would allow each to purchase whatever they want. The focus on the fungible resource of money obviates the need to know what individuals really want. This is where microeconomics stands today. I want to endogenize preferences and values to models of human behavior, by introducing evolutionary psychology to them. I want to explain what people want and why they want it, and I believe evolutionary psychology is key to such an explanation. My book The Intelligence Paradox is about explaining the origin of individual preferences and values. Given the main focus on intelligence in the book, I emphasize the role that intelligence plays in influencing people’s preferences and values. How does intelligence affect people’s preferences and values? What do more intelligent people want? What do less intelligent people want? And why are there differences?